I can’t say I use either of these words often, but I have the hardest time keeping straight the words turbid and turgid. Maybe writing about them will help me. 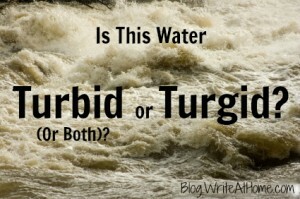 So, streams and rivers after a heavy rain might be described as turbid. Turgid, on the other hand, means “swollen,” but it is often used in a less literal sense in reference to language that is excessively embellished. In this sense, it means bombastic (a great word, by the way), or pompous. In other words, language that is swollen with self-importance. So, a river might be turbid and a speech might be turgid. Got it. But wait — after a storm, a river might be both swollen and muddy. That means it would be a turbid, turgid stream. Rats. Can anyone think of a mnemonic to help me sort these out? As always, your comments and suggestions are welcome. Leave them below. B is for blind…you can’t see through the water. That might work. Thanks, Jason.